"This Is The Dysfunctional Government We The People Elected"
Never have so "few" upset so many. Sadly, the "few" aren't worth a halfpenny. Those "few" we call dysfunctional and corrupt politicians. So in the end, we the people ..... get what we deserve. 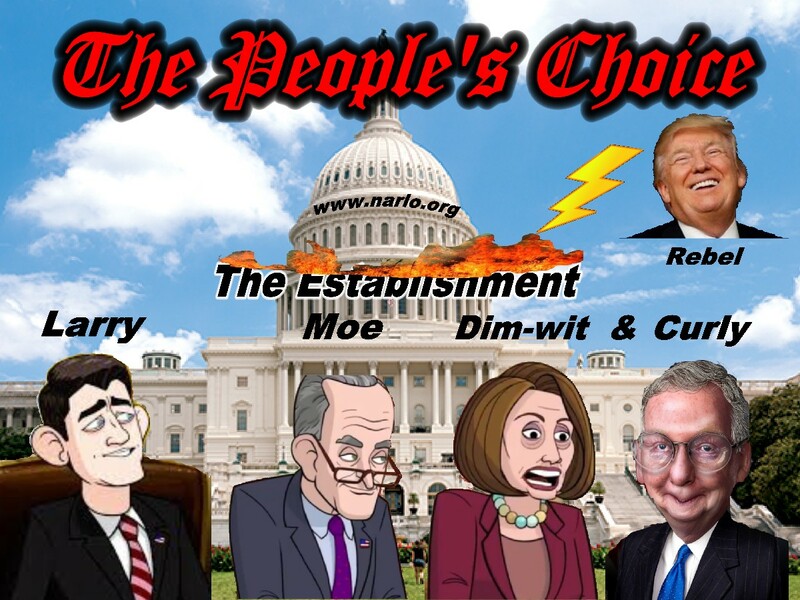 Dysfunctional, corrupt, lust, greedy, racketeers, negligent, inefficient, slovenly, collusion and conspiracy are just a few words that describe the political and bureaucratic scene, not only in Washington DC, but in many capitols around the world. Each one of these words plays out daily in all levels of the American government, federal, state and local ..... because we the people have allowed this bad behavior to exist for a very long time. If there is anyone to blame, it is the "People's Choice." It has been said that the American system of government and justice is the best system on the planet. But after many years of observing the antics of the nutcases in the political, bureaucratic and judicial asylum, by an octogenarian, that ain't saying anything special. If what exists today is the best we can do, then America, its people and freedom are in real trouble. The current government shut down is a testament to the dysfunctional nature of today's government. The politicians, who should know better, act more like petulant little children than intelligent adults. They would rather score points with their blind party constituents than do what is right for the country. Nevertheless, a secure border is an absolute necessity if national sovereignty is to be preserved. A wall (or barrier) is an integral part of that secure border and the politicians know it. In our recent article entitled, "The Ugly Truth About Property Rights" we describe how government and special interests (environmentalists and socialists) have eroded natural property rights beyond any recognition of the Founder's original intent. "Property in a thing consists not merely in its ownership and possession, but in the UNRESTRICTED right of use, enjoyment, and disposal. Anything which destroys any of the elements of property, to that extent, destroys the property itself. The substantial value of property lies in its use. If the right of use be denied, the value of the property is annihilated and ownership is rendered a barren right." Washington State Supreme Court Justice Richard B. Sanders. 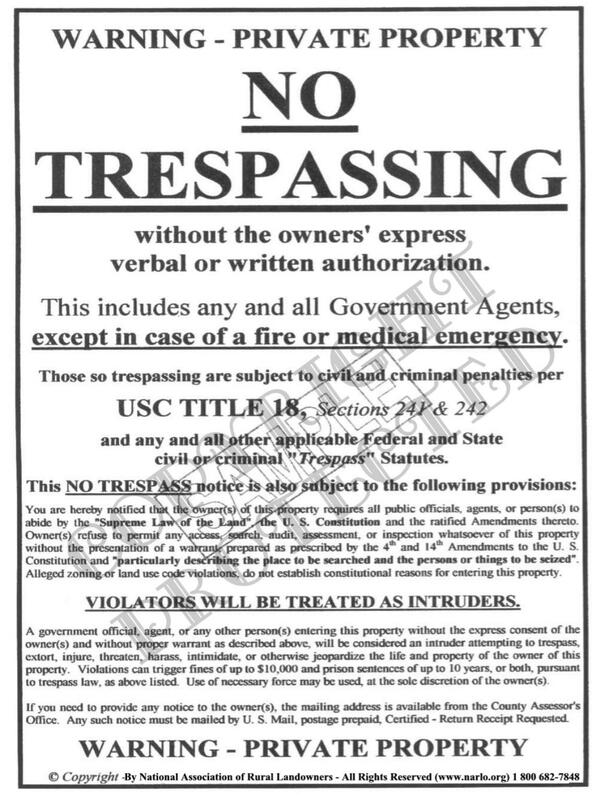 When government can regulate a persons land, buildings and personal property such that all of the use of that land and personal property is stolen or repealed by such regulation and no "just compensation" is given, there are no God-given or natural property rights. Only government has rights and freedom loses! Any sane person intuitively knows that the culture, the law, the stability and the economics of a nation are endangered by massive illegal immigration, especially if that immigration is comprised of a culture that is inherently in opposition to the existing culture. Any normal, reasonable and prudent person instinctively knows that if the make-up of those illegally immigrating to another nation are culturally poor in income levels, job skills, education and hygiene, the cost to the existing legal population will be a huge, growing and dangerous burden. To allow massive illegal immigration to continue without stopping or impeding it, is an affront to the living legal population and makes a mockery out of the rule of law. To establish sanctuaries for illegal aliens, whether by government or religious organizations, openly and blatantly violates the rights of legal citizens. Those political or religious leader's who are proponents of massive illegal immigration, open borders and illegal alien sanctuaries, are traitors to the nation and its people and should be summarily fired. "Oh what tangled webs we weave, when first we practice to deceive." And such was the case of Obama Care passed by the Democrats in 2010 and signed with glee by President Obama. The Democrats were so obsessed with leading America into a single-payer health care system, they devised a plan that was so flawed they had to engage in a group lie to the American people about its attributes. And lie they did, through their collective teeth. Not only did millions of Americans lose their health care plan, they lost their doctor as well and the hole in their pocket for the health care premiums grew larger and larger, along with the co-pays and deductibles. The taxpayer was forced to fork over $2 billion just to set up the website and other Obama Care systems. Some estimates conclude that the national debt could rise to $33 Trillion in the next 10 years due to run-away Obama Care spending. Some newly elected socialist/Democrats want to go to a Medicare-for-all system, which could balloon the national debt another $32 Trillion. This isn't just bad policy, it is the work of the insane. Why are there so many poor and homeless in America, the richest country on the planet? Because government bought them off and robbed them of their dignity and self-respect ..... for their votes. By so doing, the culture, based on cohesive families, started breaking down and only made the situation worse and the people more dependent on government. Because people are generally weak, they let government do it to us. For over 100 years Conservatives have been giving in to the Progressives on so many issues because the Progressives have been so successful at buying off a steadily growing ignorant population who vote not to preserve freedom, but vote to preserve their piece of the government money tree. Where that has gotten us is self-evident and was easy to predict. We're broke and our culture fractured! Because conservatives keep "giving in" we have thrown ourselves into the tiger's mouth and we are about to be devoured, if we haven't been already. Because freedom doesn't sell well to the morally weak, bought-off masses, we have lost our peaceful negotiating power to defend it, where are only recourse and leverage are a government shut down ..... or revolution. We have believed the other side when they say that they agree in principle with American constitutional mandates without acknowledging that they haven't the slightest intention of putting those mandates into practice. In effect, they lie and conservatives fall for it every time. Those, for whom the lies serve, will never vote against the liars and in most cases they are too uninformed to recognize the lies in the first place. The only logical conclusion we can come to is that Progressives are intentionally trying to destroy America for the sole purpose of remaining in perpetual political power. That makes Progressives enemies of America and enemies of the people. Sadly, more than half the people just don't know it, or refuse to acknowledge it, because they are blinded by the bright light of "free" stuff. Sure, there is a solution, but nowhere near enough Americans on a large enough scale are willing to step up to the plate and pay the "fine" for letting freedom slip through their fingers. The "fine" is footing the bill (that's putting up the money and lots of it) and conducting the hard work of preserving our birthright. (that's getting their hands dirty when sometimes the dirt won't wash off) They think they can do it on the cheap. They think they can duck under the radar and avoid rising tyranny. They think that all they have to do is vote every two years and hope that fortunes turn their way. As we can see from the Trump presidency and the massive effort to destroy him, just voting is not the answer to preserving liberty. One of the major battle lines is property rights. If we can't preserve property rights, then, as Thomas Jefferson said, there is no hope for preserving any other rights. We must come to the inescapable conclusion that government regulations have gone too far, in so many areas, but especially in the area of property rights. Whether urban or rural, won't you please join with us in the fight to preserve property rights at the "American Constitutional Property Rights Protection Federation".